We are aware that the costs involved in competing abroad are high. In a bid to try and raise funds for Irish Team Members, AIKLF have set up a fund raising page. Any of the Irish team members can do the same thing as Seamus. Good luck in getting our Ireland team on the road in 2016. Lets get these fundraising pages up and running guys through these links. All funds raised by the members through these links goes directly to the AIKLF federation account for the Irish Kettlebell Team. All finance will be shared evenly among qualified Irish team members to help with the future costs and expenses of clothing, equipment and travel. This is at the discretion of the AIKLF committee and Team coach. Table quiz: organise a local club table quiz and charge per table. Cake/bake sale: bake goodies and sell at your club to raise funds. Coffee morning: Organise a coffee morning in your club and charge a fee for beverages. Bag packing: Approach local supermarkets to organise a fundraising day. Volunteers help shoppers’ bag packing. Swingathon: Ask members of the public/family/ friends to sponsor athletes swinging in a relay for a set amount of time. Raffle: Ask local businesses to donate prizes towards raffle, charge for tickets. Flag day: Organise a local flag day where members of the public donate and donors are given sticky badges to show they have supported the club. Guess how many reps I’m going to lift on the day? 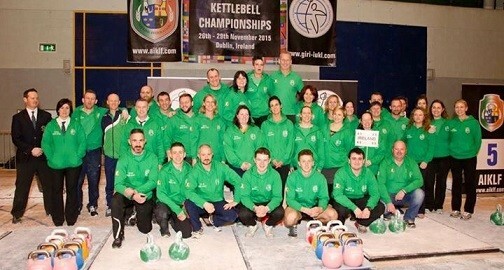 : A very clever idea thought of by Jennie Carthy of Wexford Kettlebell Club. Members of the public bet on how many repetitions you will achieve at the European championship, the person who guesses closest to the reps you have achieved wins a prize. Lotto: Sell lines to club members/family/friends and hold a weekly draw. Poker night: Host a local poker night and charge per table. We hope that some of these ideas will help towards funding your team members. Good luck to all.